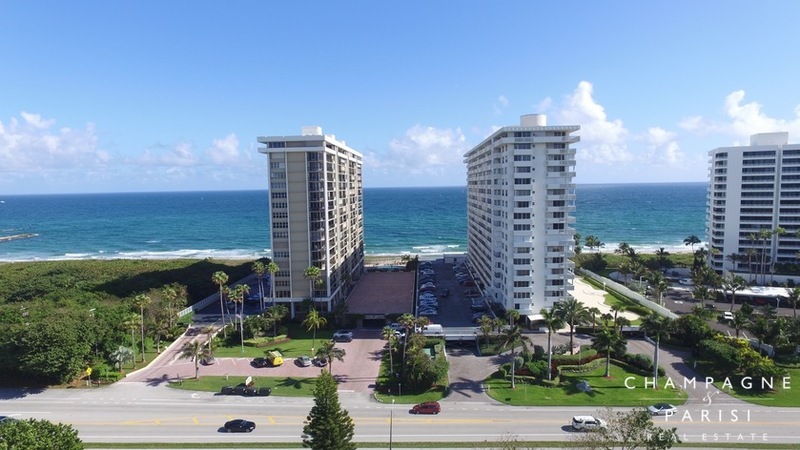 Cloister Beach Towers is an oceanfront condo complex in Boca Raton, FL that offers affordable beachfront condominiums as well as a host of resort-style amenities. Constructed in 1966, this luxury waterfront condominium community is comprised of 128 beachfront condos ranging in size from 1,200 to over 2,000 square feet of living space. Cloister Beach Towers is positioned East to West, with most units offering incredible views of the Atlantic Ocean and/or the Intracoastal Waterway. The majority of condos for sale in Cloister Beach Towers have been completely remodeled and updated to include many highly desirable, upscale features. These charming condos feature tile, wood, or plush carpet flooring, upgraded kitchens with stainless steel appliances and granite countertops, spacious bedrooms, open layouts perfect for entertaining, and private covered balconies that overlook the Atlantic Ocean, Intracoastal Waterway, and the surrounding tropical landscape. Cloister Beach Towers offers residents many resort-style amenities that can be enjoyed year round including private beach access, an expansive oceanfront swimming pool with large sundeck, as well as a newly remodeled clubhouse which was professionally designed by Robb & Stucky International, Florida's largest interior design company. Other world-class amenities at Cloister Beach Towers include 24-hour security, fully equipped fitness center and club room which overlook the Atlantic Ocean, library, game room, sauna, picnic area, private extra storage space, and secure underground parking and bike storage. Cloister Beach Towers also has an active Social Committee that organizes many events and social gatherings throughout the year. Some of the activities at Cloister Beach Towers include Poker, Mah Jong games, annual Super Bowl Parties, movie nights, and various guest lecturer seminars. Located at 1200 South Ocean Boulevard just south of Camino Real in Boca Raton, Cloister Beach Towers provides residents with easy access to various public beaches, golf courses and community parks, including South Inlet Park and Boca Inlet Park. This premier location on the Boca Raton beachfront also offers residents the convenience of being close to some of the area's finest dining, shopping, and entertainment options, including Mizner Park, one of Boca Raton's most popular attractions. If you think you would enjoy residing at Cloister Beach Towers, you may also want to visit other nearby condominium communities in Boca Raton, including Atlantic Cloisters and Cloister Del Mar. If you would like to learn more about Cloister Beach Towers or any of the surrounding waterfront condo communities in Boca Raton, please call us at 561-998-9015. You may also reach us by completing our online contact form provided at the bottom of this page. We at Champagne & Parisi Real Estate look forward to assisting you in finding your dream condo in Boca Raton! and more, updated every day. on recent sales and current market trends.